God blessed me with my first and only child, Kelcie, on September 9, 2004. She arrived two months prior to her due date. She needed a respirator and oxygen to help her breathe and was swarmed with cords attached to multiple machines to monitor her heart rate and oxygen. As with most babies who are born premature, the doctors did an MRI on her little brain and discovered multiple cysts caused from lack of oxygen to her brain during her early birth. The words Periventricular Leukomalacia were foreign to me. I later learned that it is a brain condition that affects newborns and the white matter in the brain that is responsible for sending information to the brain, spinal cord, and to the muscles. So basically, my precious baby had brain damage. I had no idea to what extent but we started therapy as soon as we could so she could live up to her fullest potential. After four long weeks at the neonatal intensive care unit, I got to take my fragile 3 pound 14 ounce baby home with her tank of oxygen. I am proud to say that even though Kelcie has been through many tough circumstances, she has remained such a happy, witty, and motivated child. Thankfully, the brain damage has only affected her physically and she is a very intelligent girl who rocks the coolest hot pink wheelchair and bright red walker. We started attending Personal Ponies when Kelcie was eight years old. Within the past year and a half, I have been able to witness her smile shine even brighter. She absolutely loves being in control of the pony, especially because there’s many things about her physical body that are out of her control. She used to get startled very easily and with the weekly interaction with the ponies, it has minimized drastically. She can even sit/lay on Magic’s back and do stretches that help her spastic (tight) muscles to relax. She also enjoys washing, painting (yes, painting) and feeding the ponies, especially adorable Cookie Face. This helps reinforce being responsible, caring, and nurturing, all well having such a fun time! It is such a blessing to be a part of Personal Ponies and we are so grateful and look forward to being a part of it for many years to come. My heart melts, and I can’t help but smile every week when Kelcie visits the barn for her special “One-On-One Pony Time”!!! Since our Personal Ponies participate in so many events in the community, I had met Kelcie many times before she started participating in weekly sessions. Each time, whether at her school or a large community special needs event, her face lit up when she interacted with the ponies. I could immediately see that this was a match made in heaven!!! I was thrilled when Kelcie’s mom Courtney, inquired about making Kelcie a part of our Personal Ponies family!!! Every child can participate in his/her own unique way! Every week that’s just what Kelcie did! We found brushes small enough for her little fingers to grasp and she was able to groom Cookie Face. 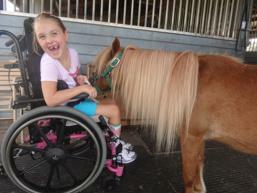 With some support, she was able to leave her little pink wheelchair behind and take “HER PONY” for a walk! What began as “hand over hand help” is now independence with her “I CAN” attitude! Kelcie has never let her physical differences stand in the way! I look forward to seeing Kelsie work with “HER PONIES” for many years to come! 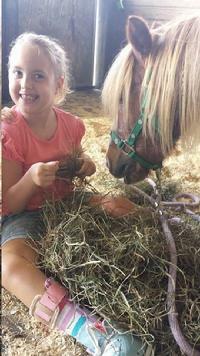 Kelcie is a true example of “THE MAGIC OF PERSONAL PONIES”!!!!! !